A recently discovered asteroid called Asteroid 2008 TC3 burned up in the atmosphere over Sudan this morning (October 7th, 2008). 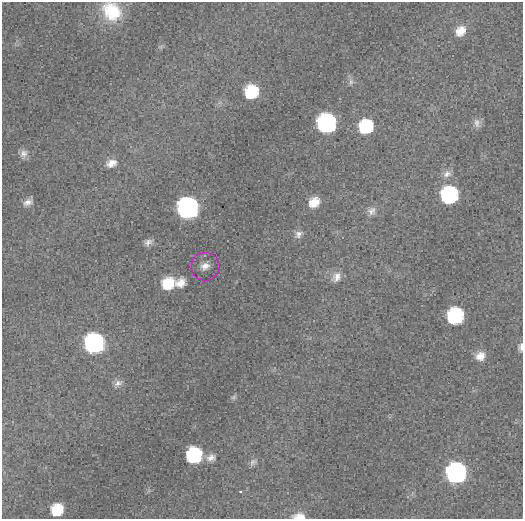 Asteroid 2008 TC3, circled at right, is thought to have been about 2-5 meters wide (6-15 feet). 2008 TC3 was discovered by the Mt. Lemmon Survey yesterday, leaving about a 20 hour warning of the asteroid's atmospheric entry. While the asteroid was given a nearly 100% chance of atmospheric entry, the chance of it actually striking the surface were extremely slim due to the asteroid's highly inclined entry angle. The asteroid entered the Earth's atmosphere at an angle of about 20* from horizontal. This steep angle, combined with the asteroids looser composition allowed it to break apart and burn up in the atmosphere over Northern Sudan, causing no damage on the planet surface. This is the first time astronomers have been able to successfully predict an asteroid entering our atmosphere. Of course, this marks a major milestone in learning to predict and possibly prevent future incidences of asteroid hazards. I've been looking for video or images, but since the atmospheric entry occured over a relatively sparsely populated region, there is a slim chance of any type of images. If I find anything, though, I will be happy to share it here. Image courtesy of: Richard Kowalski and Ed Beshore, Catalina Sky Survey. Hiya! Quick Question That's Entirely Off Topic. Do You Know How To Make Your Site Mobile Friendly? read here My Website Looks Weird When Viewing From My Iphone. I'm Trying To Find A Template Or Plugin That Might Be Able To Fix This Problem. If You Have Any Recommendations, Please Share. Thank You! It had been fantastic and also beneficial. Seeing that the initial targeted visitor on your blog site my business is incredibly fascinated. I stumbled upon much beneficial material with your document. At this point press Cash Advance Appreciate it intended for placing. Good luck. Employ a beneficial timing.